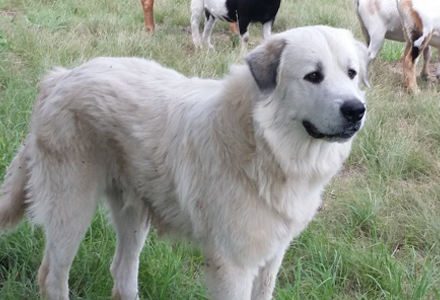 At Lone Star Goats, we breed Great Pyrenees and Anatolian Shepherd dogs and use them as livestock guardians for our herds. Contact us at lonestargoats@gmail.com for more information on available puppies and future litters. We can't say enough about our dogs. They are loyal, devoted to their herd, well socialized and amazing to watch when working. Cedar, Cody, Browning, Sophie and Bear are full-blood CKC-registered Great Pyrenees and full-time working dogs. 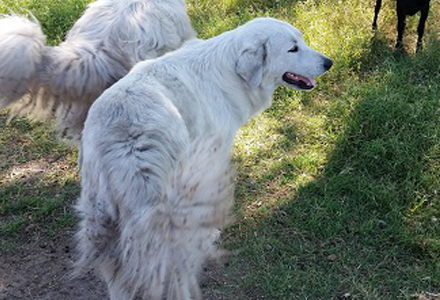 Shelby and Jacob are half Great Pyrenees and half Anatolian Shepherd, also an excellent livestock guardian breed. They guard four different herds and do a magnificent job. The Great Pyrenees and Anatolian breeds are a must if you plan to raise goats and have them protected from predators such as foxes, coyotes, and bobcats. 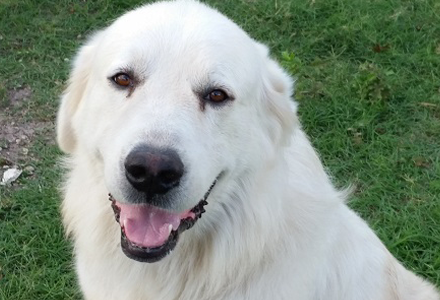 The Great Pyrenees dog is confident, gentle (especially with children), and affectionate. While territorial and protective of its flock or family when necessary, its general demeanor is patience and loyalty. It is a strong willed, independent and reserved breed. It is also attentive, quite fearless, and loyal to its duties. 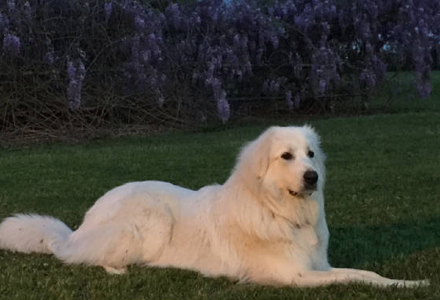 The Great Pyrenees' size makes it an imposing guardian. A dog of this breed will patrol its perimeter routinely to ensure protection of its herd. The Great Pyrenees protects its flock by barking, and being nocturnal, it tends to bark at night unless trained against such behavior. 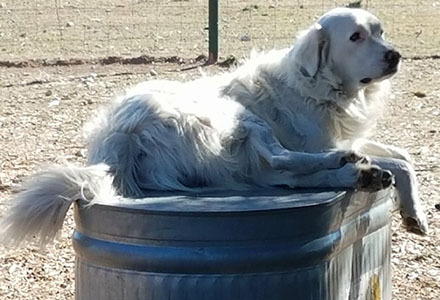 When there is a goat in distress, the well-trained Pyrenees will protect them at all costs. With two dogs each for the four herds in our four pastures, we have no trouble with foxes, bobcats, or coyotes. The Anatolian is large, rugged, fast and powerful. They are a working guard dog, possessing a superior ability to protect livestock. 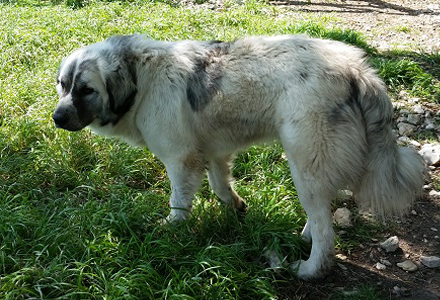 The Anatolian’s loyalty, independence and hardiness are cherished by breeders and owners. The breed’s coat can be short (one inch) or rough (approximately four inches) with all color patterns and markings, including fawn and brindle. They are smart, protective and territorial. Pyrenees and Anatolians actually bond to their livestock and will exhibit nurturing behaviors, especially to young animals. Our females will generally lay with a doe that is about to deliver her kids and help clean them up. 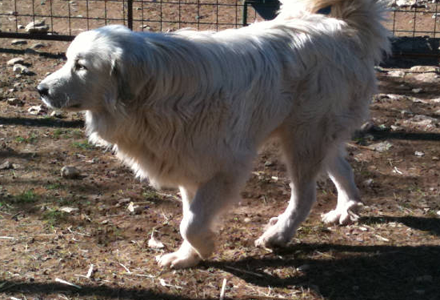 Great Pyrenees is considered by some to be the #1 livestock guardian dog and the Anatolian Shepherd to be #2. We would not be able to raise goats without them. This is Sampson, a past puppy of Cedar and Cody. Thank you to the McDonalds of Katy, Texas, for sharing this picture. 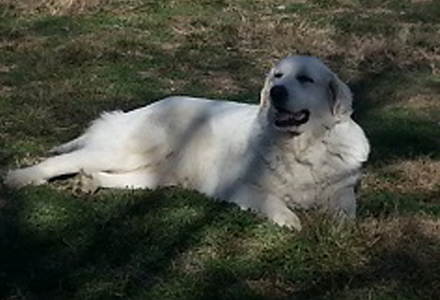 He is a beautiful Great Pyrenees and proves that they make great family pets or livestock guardian dogs.